the software tools available to help investors are hard-to-use, operate in silos and flood the user with data that only experts can understand. SaralStocks solves these problems by automating end-to-end stock lifecycle processes. Discovery of growth stocks becomes simpler and quicker and Portfolio can be managed through algorithmic (“algo”) decision making that even a new investor can use. 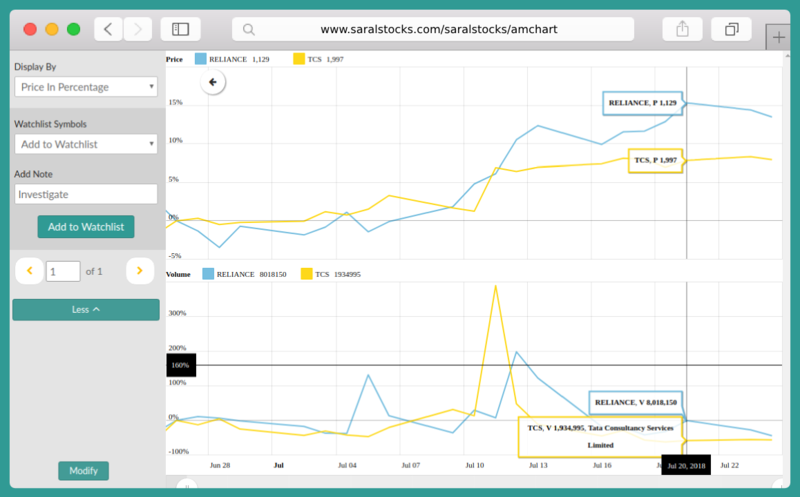 SaralStocks automates full range of investment activities for effective portfolio management through integration of best practices and technology in one tool. It eliminates need for spreadsheets, handwritten and mental notes, and gives clear visibility into portfolio. has simple, uncluttered interface to help user in managing her portfolio. recommends when to enter or exit stock/markets through use of standard technical indicators. saves time with quick scan of markets helping user identify a small number of stocks from which to select few to add to Watchlist. does not burden user with humongous data. Cuts through market noise. lets Watchlist to be shared with user’s investment group for joint stock discovery. helps in rule-based tracking of Watchlist. The product has user configurable rules which trigger alerts when conditions for the rule are matched. It also has built-in rules so the user can start using the application without any learning. The user can add or update these rules for Watchlist, Portfolio or cash allocation. 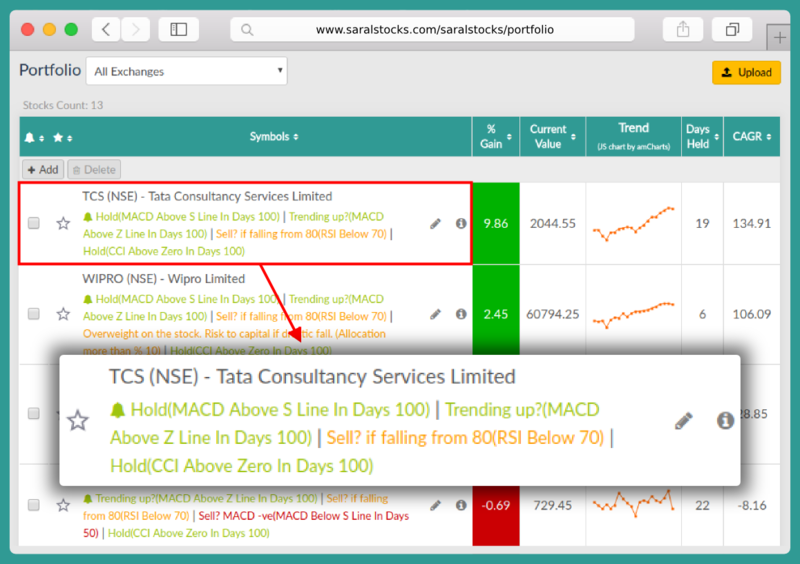 The user can employ preset research filters such as "NSE high volume bullish - last 3 days" to see which stocks are moving upwards on high volume. Similarly by changing "Price Decreased by" value in "Edit Advanced Condition" dialog window, she should find stocks that have fallen in the last session. She can also set her own filter criteria, and save for the future. 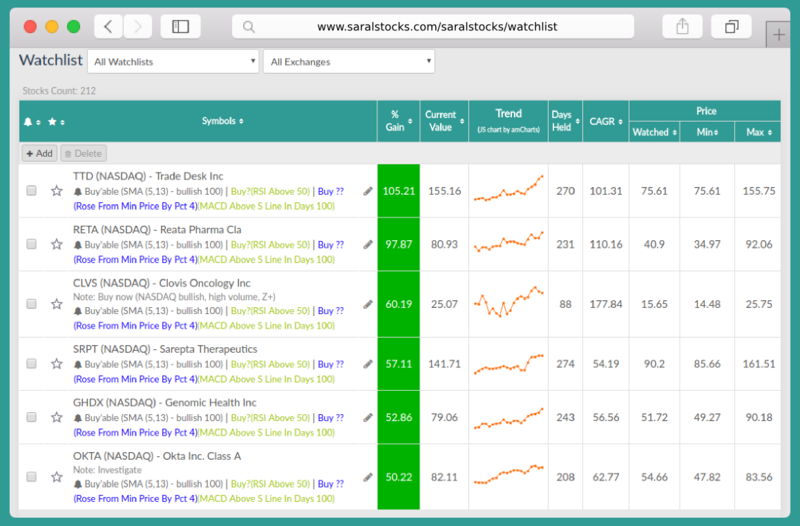 SaralStocks lets user scan stock markets with single click for growth stocks. Alongside research based on Charts & various Technical Indicators, user can validate her hypotheses with in-depth research available on free external websites through links provided to: Economic Times, Screener.in , IndiaNotes, Yahoo Finance, Zerodha & others. She can then handpick stocks to put on Watchlist for further observation. After selecting a stock to add to Watchlist, rule-based alerts will help her make buy or not decision. The decision parameters could be one or more of CAGR, price, trend, volume traded in a period of time, etc. Trade book or transaction data can be imported with one-click from the user's broker. Just as for Watchlist, by applying rules to Portfolio, user can decide whether to sell/hold/buy more for any stock. Cash Alerts on liquidity position let user know if she has too much cash uninvested, or too little left to invest if in case of a market correction. 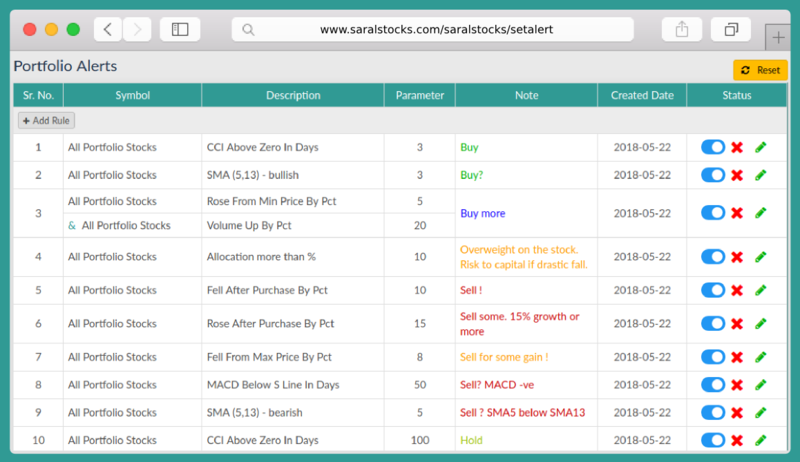 SaralStocks helps user to follow systematic approach for maximizing her Portfolio without investing too much time. It also helps in detecting a trend sooner. The user can share Watchlist with her friends or advisor for joint stock discovery. The user's advisor can share own Watchlist and tell her which stocks to keep track of, thus the chances of missing important buy opportunities or recommendations because of inefficient information exchange are greatly reduced. A Watchlist can be arranged by its owner around any of these parameters: Price, %Gain, CAGR, days since put on list. These parameters help her in quickly identifying stocks that are on the move. Her alerts & notes for each stock can be made visible to other users with access to her Watchlist. 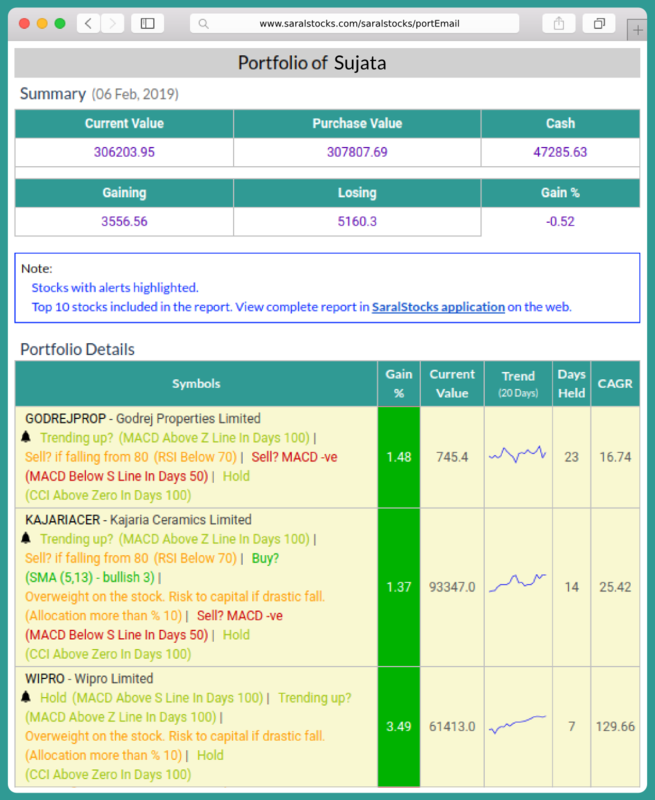 User receives daily email with a scan of her Portfolio and appropriate alerts based on MACD & other important indicators. SaralStocks is a product of Affingo Technologies LLP founded in 2015. Suhas Patil, Founder and CEO, is a B.Tech from IIT Bombay and MS from New Jersey Institute of Technology, USA. He drives strategy & product innovation at Affingo. Mayank Agarwal, Director of Marketing, has rich experience of working with financial services clients in India and abroad. He is a graduate of IIT Kanpur and IIM Calcutta.